Of all the winter outdoor activities in Connecticut, ice fishing requires the most patience, fortitude and layers of clothes. Yet, the rewards can be heartwarming, especially if you share the sport with young kids. When winter grabs Connecticut in its icy grip, ice fishing opportunities abound statewide, and the state's Department of Energy & Environmental Protection (DEEP) has programs to encourage families with kids to embrace the sport. In 2012, Connecticut revised its regulation limiting children under 16 to ice fishing with only two devices (tip-ups, floats/bobbers or hand-held jigs). Now, kids can monitor up to six devices, each with up to three baits—just like adults—increasing their chances of success and of developing a life-long passion for the pursuit. The DEEP's Connecticut Aquatic Resources Education (CARE) Program holds Ice Fishing Classes at locations around the state during the months of January and February to introduce the sport to new enthusiasts of all ages. Kids can also try ice fishing at a free, fun winter event held annually (ice conditions permitting): the No Child Left Inside Winter Festival at Burr Pond State Park in Torrington, CT, on Saturday, February 2, 2019. Lake Maps are available online as downloadable .pdfs. The CTFishTalk.com board is a terrific resource for learning from other anglers where the big fish are biting. 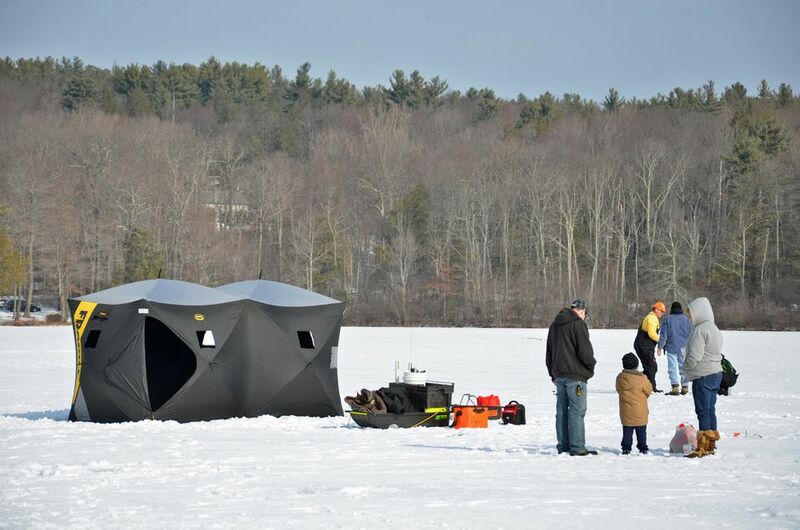 The Connecticut ice fishing season begins when ice on lakes and ponds reaches a safe thickness of at least four inches, and it generally runs until the end of February (some lakes can be fished until the end of March). An ice thickness of 6 inches is even better, and you should stay alert to potential thin spots even when you've determined a lake or pond is sufficiently frozen. If you are new to the sport of ice fishing, it is important to keep some safety basics in mind. Ice thickness varies due to a variety of environmental factors, so be sure to check the ice on each lake carefully before setting out each time. Be sure to dress for the weather conditions, and never ice fish alone. Ice fishing requires a valid Connecticut fishing license, which may be purchased at town halls, bait and tackle shops and many stores that sell outdoor sporting equipment (find locations). Resident and nonresident fishing licenses may also be purchased online. For complete information on Connecticut fishing regulations and destinations, download the Connecticut Angler's Guide in .pdf or digital book format, or call the DEEP Inland Fisheries Division at 860-424-FISH (3474) to request your copy. Introducing children to ice fishing? All kids under the age of 16 are eligible to receive a free YOUth Fishing Passport from the DEEP. Follow these instructions to make your request. The Passport adds an extra level of excitement to family fish-chasing adventures. Still Don't Know Where to Start? Book a guided ice fishing trip in Connecticut with Bassmaster Elite Series Professional Angler Paul Mueller. All you have to do is bundle up and bring hot beverages, food and your camera. He'll provide instruction and gear.